Belarusian President Aleksandr Lukashenko has stated that his country accepts that Crimea is now de-facto a part of Russia. “We agree with the Russian Federation on that,” the leader said. Lukashenko stressed that no one has asked Belarus to recognize or not to recognize Crimea as the federal subject of Russia. “Crimea isn’t an independent state. It’s part of the Russian territory. 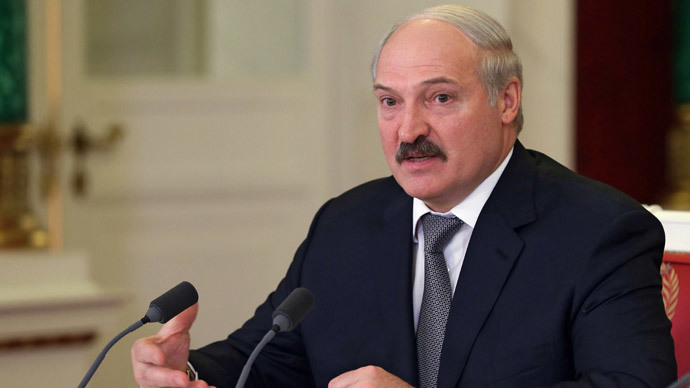 One can recognize or not recognize that, it will change nothing,” Lukashenko told journalists in Minsk on Sunday. “I am asked where my country is in this situation. Taking into account historical processes, in the framework of the CIS, we’re linked with agreements, and we’ll be with [on the side of] the Russian Federation,” the Belarus president added. However, he stressed that Belarus isn’t against NATO. “If the question arises, we’ll be with Russia forever,” Lukashenko said. Belarus will build a relationship with the new Ukrainian government after it is elected, Lukashenko also stated. “Whoever is elected by the Ukrainian people, we’ll support them. They are our neighbors, not some strangers to us,” the Belarusian leader said. He added that Belarus can’t scrap its partnership with Ukraine, as their combined turnover of goods was 7 billion dollars last year. The Belarusian president thinks that statements about quitting the CIS by the coup-appointed Ukrainian politicians are shortsighted. He said he will propose discussing the issue with Ukrainian politicians. The exit of Ukraine from the CIS would be a heavy blow – “but not a deadly one,” Lukashenko further noted. On Friday, the republic of Crimea and the city of Sevastopol have been officially accepted into the Russian Federation, with president Putin signing the finalizing decree.